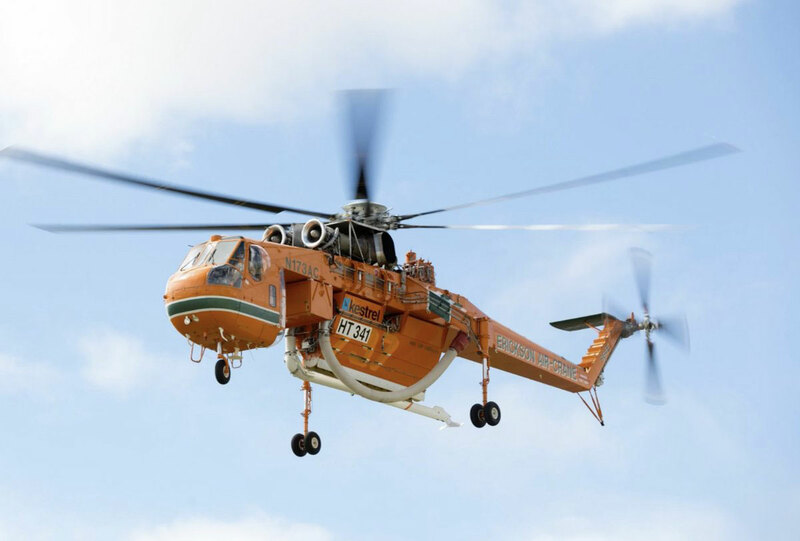 An Erickson Aircrane was lost while firefighting in Australia earlier yesterday. All three crewmembers survived when the 1967 S-64E, N173AC, better known as “Christine,” crashed while fighting the Thomson Complex Catchment fires in Gippsland, Victoria. According to official reports, the helicopter, call sign Helitak 341, crashed near the edge of a dam or into the dam. The accident occurred at approximately 7:15 p.m. local time near Jericho in an area of difficult access and hilly topography known as the Yarra Ranges. First responders needed nearly an hour to reach the crash site. Fortunately, the crew was able to swim to safety. The Aircrane was one of 10 aircraft on the fire; Victoria has 49 contracted aircraft for firefighting this season, including two Aircranes. Erickson holds the type certificate for the S-64 and operates approximately 20 Aircranes worldwide. It also services and builds S-64s for third-party customers. When rigged for firefighting, the aircraft is typically fitted with a 2,650-gallon water tank and a quick-fill snorkel. Three other Aircranes operating in Australia have been grounded pending a safety review.